A gluten free, made from scratch take on everyone’s favorite colorful cake! 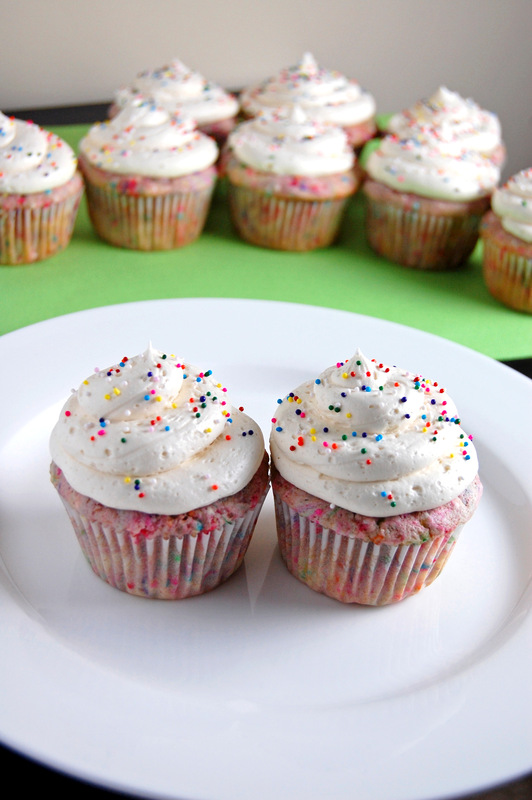 No bake sale, birthday, party, road trip, or holiday can really be complete without funfetti cake. It’s the best boxed cake mix there is and something I’ve actively missed eating over the past few years. If you are or someone you want to bake a treat for is gluten free, fear not! I present to you the perfect gluten free, made from scratch funfetti cupcakes. They’re bursting with sprinkles (can you tell they dyed the batter a little bit? just go with it.) The frosting is light and fluffy and the perfect partner for the cakes! Moving on from my sappiness. Back to the cupcakes. The biggest decision you’ll have here is what kind of sprinkles you want to use. You can go the traditional sprinkle route, or use nonpareils (little sprinkle balls, basically) like I did. In my mind, nonpareils were going to make the cupcakes a little more…elegant? I’m not entirely sure. What I ended up realizing is that they tend to bleed. So, yes, the batter got a little bit pinkish/purple. I’m not mad about it, but let it serve as a warning to you that if you want white cakes with sprinkles dotted throughout, you should probably go with traditional sprinkles. As for the frosting, you need something sweet, but not too sweet. The traditional funfetti frosting is vanilla, so I went with a basic vanilla buttercream. Whip your buttercream for as long as you can possibly stand so that it’s extra light and fluffy when you pipe, spread, or plop it onto your cupcakes. Sprinkles on top are a necessity. Happy Easter, happy birthday, happy baking! 1. Preheat oven to 350 degrees. Line a standard muffin tin with liners or spray with nonstick spray. 2. In the bowl of a stand mixer fitted with paddle attachment or by hand with an electric mixer, cream the butter and sugar for 3-4 minutes until very light and fluffy, scraping down the sides of the bowl as necessary. 3. Add in the eggs and vanilla and beat until combined. 4. In another bowl, whisk together the GF flour, cornstarch, and baking powder. Add half of the dry ingredients to the wet ingredients and mix until just combined. 5. Pour in milk and mix until combined. Add the rest of the dry ingredients and beat for about 1 minute. 6. Pour in sprinkles and fold in by hand. The more gentle you are, the less they will bleed. 7. Fill cupcake liners 3/4 full. Bake for 18-22 minutes or until the tops spring back when touched and a toothpick inserted into the cakes comes out mostly clean. Remove from the oven and let cool in pan for 5-10 minutes before removing and letting cool on a wire rack. 8. For buttercream: While cupcakes are cooling, make buttercream. In the bowl of a stand mixer fitted with the whisk attachment, or by hand with an electric mixer, beat the butter on high for 4 minutes until completely smooth, creamy, and fluffy. Slowly add in the powdered sugar with the mixer on low and beat to combine. Add the vanilla extract and beat on high for 3-4 minutes, until very fluffy. 9. When cupcakes are completely cool, pipe or spread the icing on. Top with sprinkles.